Not to be confused with Galicia (Spain). Galicia (/ɡəˈlɪʃ(i)ə/; Ukrainian and Rusyn: Галичина, Halyčyna; Polish: Galicja; Czech and Slovak: Halič; German: Galizien; Hungarian: Galícia/Kaliz/Gácsország/Halics; Romanian: Galiția/Halici; Russian: Галиция, Galitsiya; Yiddish: גאַליציע‎ Galitsiye) is a historical and geographic region between Central and Eastern Europe. It was once the small Kingdom of Galicia–Volhynia and later a crown land of Austria-Hungary, the Kingdom of Galicia and Lodomeria, which straddled the modern-day border between Poland and Ukraine. The area, named after the medieval city of Halych, was first mentioned in Hungarian historical chronicles in the year 1206 as Galiciæ. In 1253 Prince Daniel of Galicia was crowned the King of Rus (Latin: Rex Rusiae) or King of Ruthenia following the Mongol invasion in Ruthenia (Kievan Rus). In 1352 the Kingdom of Poland annexed the Kingdom of Galicia and Volhynia as the Ruthenian Voivodeship (Latin: Palatinatus Russiae). The nucleus of historic Galicia lies within the modern regions of western Ukraine: the Lviv, Ternopil and Ivano-Frankivsk oblasts near Halych. In the 18th century, territories that later became part of the modern Polish regions of the Lesser Poland Voivodeship, Subcarpathian Voivodeship and Silesian Voivodeship were added[by whom?] to Galicia. It covers much of such historic regions as Red Ruthenia (centered on Lviv) and Lesser Poland (centered in Kraków). Galicia became contested ground between Poland and Ruthenia from medieval times, and in the 20th century between Poland and Ukraine. In the 10th century, several cities were founded in Galicia, such as Volodymyr and Jaroslaw, whose names mark their connections with Grand Princes of Kiev. There is considerable overlap between Galicia and Podolia (to the east) as well as between Galicia and south-west Ruthenia, especially in a cross-border region (centred on Carpathian Ruthenia) inhabited by various nationalities. Andrew II, King of Hungary from 1205 to 1235, claimed the title Rex Galiciae et Lodomeriae ("King of Galicia and Lodomeria") – a Latinised version of the Slavic names Halych and Volodymyr, the major cities of the principality of Halych-Volhynia, which the Hungarians ruled from 1214 to 1221. Halych-Volhynia had cut a swathe as a mighty principality under the rule of Prince Roman the Great (Roman Mstislavich) in 1170–1205. After the expulsion of the Hungarians in 1221, Ruthenians took back rule of the area. Roman's son Daniel of Galicia (Prince of Galicia until 1255) was crowned king of Halych-Volhynia in 1253. About 1247 Daniel of Galicia founded Lviv (Leopolis), named in honour of his son Leo I, who later moved the capital northwestwards from Halych to Lviv in 1272. The Ukrainian name Halych (Галич) (Halicz in Polish, Галич in Russian, Galic in Latin) comes from the Khwalis or Kaliz who occupied the area from the time of the Magyars. They were also called Khalisioi in Greek, and Khvalis (Хваліс) in Ukrainian. Some historians[a] speculated that the name had to do with a group of people of Thracian origin (i.e. Getae) who during the Iron Age moved into the area after Roman conquest of Dacia in 106 CE and may have formed the Lypytsia culture with the Venedi people who moved in the region at the end of Le Tène period (La Tène culture). The Lypytsia culture supposedly replaced the existing Thracian Hallstatt (see Thraco-Cimmerian) and Vysotske cultures. Connection with Celtic peoples supposedly explains the relation of the name "Galicia" to many similar place names found across Europe and Asia Minor, such as ancient Gallia or Gaul (modern France, Belgium, and northern Italy), Galatia (in present-day Turkish Asia Minor), the Iberian Peninsula's Galicia, and Romanian Galați. Some other scholars[who?] assert that the name Halych has Slavic origins – from halytsa, meaning "a naked (unwooded) hill", or from halka which means "jackdaw". (The jackdaw featured as a charge in the city's coat of arms and later also in the coat of arms of Galicia-Lodomeria. The name, however, predates the coat of arms, which may represent canting or simply folk etymology.) Although Ruthenians drove out the Hungarians from Halych-Volhynia by 1221, Hungarian kings continued to add Galicia et Lodomeria to their official titles. Casimir by the grace of God king of Poland and Rus (Ruthenia), lord and heir of the land of Kraków, Sandomierz, Sieradz, Łęczyca, Kuyavia, Pomerania (Pomerelia). [In Latin: Kazimirus, Dei gratia rex Polonie et Rusie, nec non Cracovie, Sandomirie, Siradie, Lancicie, Cuiavie, et Pomeranieque Terrarum et Ducatuum Dominus et Heres. Following the death of Casimir in 1370, Poland entered into a personal union with Hungary (1370-1382) and Ruthenia (Galicia) came under the rule of a Ruthenian lord, Vladislaus II of Opole, appointed by the King of Hungary. Later Galicia was ruled for short time by various Hungarian voivodes of Ruthenia. Under the Jagiellonian dynasty (Kings of Poland from 1386 to 1572, the Kingdom of Poland revived and reconstituted its territories. In place of historic Galicia there appeared the Ruthenian Voivodeship. In 1526, after the death of Louis II of Hungary, the Habsburgs inherited the Hungarian claims to the titles of the Kingship of Galicia and Lodomeria, together with the Hungarian crown. In 1772 the Habsburg Empress Maria Theresa, Archduchess of Austria and Queen of Hungary, used those historical claims to justify her participation in the first partition of Poland. In fact, the territories acquired by Austria did not correspond exactly to those of former Halych-Volhynia - the Russian Empire took control of Volhynia to the north-east, including the city of Volodymyr-Volynskyi (Włodzimierz Wołyński) – after which Lodomeria was named. On the other hand, much of Lesser Poland – Nowy Sącz and Przemyśl (1772–1918), Zamość (1772–1809), Lublin (1795–1809), and Kraków (1846–1918) – became part of Austrian Galicia. Moreover, despite the fact that Austria's claim derived from the historical Hungarian crown, "Galicia and Lodomeria" were not officially assigned to Hungary, and after the Ausgleich of 1867, the territory found itself in Cisleithania, or the Austrian-administered part of Austria-Hungary. The full official name of the new Austrian territory was the Kingdom of Galicia and Lodomeria with the Duchies of Auschwitz and Zator. After the incorporation of the Free City of Kraków in 1846, it was extended to Kingdom of Galicia and Lodomeria, and the Grand Duchy of Kraków with the Duchies of Auschwitz and Zator (German: Königreich Galizien und Lodomerien mit dem Großherzogtum Krakau und den Herzogtümern Auschwitz und Zator). Each of those entities was formally separate; they were listed as such in the Austrian emperor's titles, each had its distinct coat-of-arms and flag. For administrative purposes, however, they formed a single province. The duchies of Auschwitz (Oświęcim) and Zator were small historical principalities west of Kraków, on the border with Prussian Silesia. Lodomeria, under the name Volhynia, remained under the rule of the Russian Empire - see Volhynian Governorate. Mountain Dwellers (larger kinship group): Żywczaki or Gorals of Żywiec (pl: górale żywieccy), Babiogórcy or Gorals of Babia Góra, Gorals of Rabka or Zagórzanie, Kliszczaki, Gorals in Podhale (pl: górale podhalańscy), Gorals of Nowy Targ or Nowotarżanie, Górale pienińscy or Gorals of Pieniny and Górale sądeccy (Gorals of Nowy Sącz), Gorals of Spisz or Gardłaki, Kurtacy or Czuchońcy (Lemkos, Rusnaks), Boykos (Werchowyńcy), Tucholcy, Hutsuls (Czarnogórcy). Dale Dwellers (larger kinship group): Krakowiacy, Mazury, Grębowiacy (Lesowiacy or Borowcy), Głuchoniemcy, Bełżanie, Bużanie (Łopotniki, Poleszuki), Opolanie, Wołyniacy, Pobereżcy or Nistrowianie. In Roman times, the region was populated by various tribes of Celto-Germanic admixture, including Celtic-based tribes – like the Galice or "Gaulics" and Bolihinii or "Volhynians" – the Lugians and Cotini of Celtic, Vandals and Goths of Germanic origins (the Przeworsk and Púchov cultures). During the Great Migration period of Europe (coinciding with the fall of the Roman Empire), a variety of nomadic groups invaded the area. Overall, Slavs (both West and East Slavs, including White Croats, Lendians as well as Rusyns) came to dominate the Celtic-German population. In the 12th century, a Rurikid Principality of Halych (Halicz, Halics, Galich, Galic) formed there, which merged in the end of the century with the neighbouring Volhynia into the Principality of Halych Volhynia. Galicia and Volhynia had originally been two separate Rurikid principalities, assigned on a rotating basis to younger members of the Kievan dynasty. The line of Prince Roman the Great of Vladimir-in-Volhynia had held the principality of Volhynia, while the line of Yaroslav Osmomysl held the Principality of Halych (later adopted as Galicia). Galicia–Volhynia was created following the death in 1198 or 1199 (and without a recognised heir in the paternal line) of the last Prince of Galicia, Vladimir II Yaroslavich; Roman acquired the Principality of Galicia and united his lands into one state. Roman's successors would mostly use Halych (Galicia) as the designation of their combined kingdom. In Roman's time Galicia–Volhynia's principal cities were Halych and Volodymyr-in-Volhynia. In 1204, Roman captured Kiev, while being in alliance with Poland, he signed a peace treaty with Hungary and established diplomatic relations with the Byzantine Empire. In 1205, Roman turned against his Polish allies, leading to a conflict with Leszek the White and Konrad of Masovia. Roman was subsequently killed in the Battle of Zawichost (1205), and his dominion entered a period of rebellion and chaos. Thus weakened, Galicia–Volhynia became an arena of rivalry between Poland and Hungary. King Andrew II of Hungary styled himself rex Galiciæ et Lodomeriæ, Latin for "king of Galicia and Vladimir [in-Volhynia]", a title that later was adopted in the Habsburg Empire. In a compromise agreement made in 1214 between Hungary and Poland, the throne of Galicia–Volhynia was given to Andrew's son, Coloman of Lodomeria. In 1352, when the principality was divided between the Polish Kingdom and the Grand Duchy of Lithuania, the territory became subject to the Polish Crown. With the Union of Lublin in 1569 Poland and Lithuania merged to form the Polish-Lithuanian Commonwealth, which lasted for 200 years until conquered and divided up by Russia, Prussia, and Austria. In 1772 with the partition of the Polish-Lithuanian Commonwealth, the south-eastern part of the former Polish-Lithuanian Commonwealth was awarded to the Habsburg Empress Maria-Theresa, whose bureaucrats named it the Kingdom of Galicia and Lodomeria, after one of the titles of the princes of Hungary, although its borders coincided but roughly with those of the former medieval principality. Known informally as Galicia, it became the largest, most populous, and northernmost province of the Austrian Empire until the dissolution of that monarchy at the end of World War I in 1918, when it ceased to exist as a geographic entity. During the First World War, Galicia saw heavy fighting between the forces of Russia and the Central Powers. The Russian forces overran most of the region in 1914 after defeating the Austro-Hungarian army in a chaotic frontier battle in the opening months of the war. They were in turn pushed out in the spring and summer of 1915 by a combined German and Austro-Hungarian offensive. In 1918, Western Galicia became a part of the restored Republic of Poland, which absorbed the Lemko-Rusyn Republic. The local Ukrainian population briefly declared the independence of Eastern Galicia as the "West Ukrainian People's Republic". During the Polish-Soviet War the Soviets tried to establish the puppet-state of the Galician SSR in East Galicia, the government of which after a couple of months was liquidated. The fate of Galicia was settled by the Peace of Riga on 18 March 1921, attributing Galicia to the Second Polish Republic. Although never accepted as legitimate by some Ukrainians, it was internationally recognized on 15 May 1923. The Ukrainians of the former eastern Galicia and the neighbouring province of Volhynia made up about 12% of the Second Polish Republic population, and were its largest minority. As Polish government policies were unfriendly towards minorities, tensions between the Polish government and the Ukrainian population grew, eventually giving rise to the militant underground Organization of Ukrainian Nationalists. In 1773, Galicia had about 2.6 million inhabitants in 280 cities and market towns and approximately 5,500 villages. There were nearly 19,000 noble families, with 95,000 members (about 3% of the population). The serfs accounted for 1.86 million, more than 70% of the population. A small number were full-time farmers, but by far the overwhelming number (84%) had only smallholdings or no possessions. Linguistically, the Polish language was predominant in Galicia. According to the 1910 census 58.6% of the combined population of both western and eastern Galicia spoke Polish as its mother tongue compared to 40.2% who spoke the Ukrainian language. The number of Polish-speakers may have been inflated because Jews were not given the option of listing Yiddish as their language. The Jews of Galicia had immigrated in the Middle Ages from Germany. German-speaking people were more commonly referred to by the region of Germany where they originated (such as Saxony or Swabia). For inhabitants who spoke different native languages, e.g. Poles and Ruthenians, identification was less problematic, but widespread multilingualism blurred the ethnic divisions again. It is, however, possible to note that Galicia was a very Catholic state. Roman Catholicism was practiced in two rites. Poles were Roman Catholic, the Ukrainians belonged to the Greek Catholic Church, but were both overwhelmingly Catholic. The Jews represented the third largest religious group. 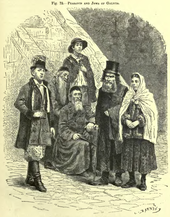 Galicia was the center of the branch of Orthodox Judaism known as Hasidism. The new state borders cut Galicia off from many of its traditional trade routes and markets of the Polish sphere, resulting in stagnation of economic life and decline of Galician towns. Lviv lost its status as a significant trade centre. After a short period of limited investments, the Austrian government started the fiscal exploitation of Galicia and drained the region of manpower through conscription to the imperial army. The Austrians decided that Galicia should not develop industrially but remain an agricultural area that would serve as a supplier of food products and raw materials to other Habsburg provinces. New taxes were instituted, investments were discouraged, and cities and towns were neglected. The result was significant poverty in Austrian Galicia. Galicia was the poorest province of Austro-Hungary, and according to Norman Davies, could be considered "the poorest province in Europe". Near Drohobych and Boryslav in Galicia, significant oil reserves were discovered and developed during the mid 19th and early 20th centuries. The first European attempt to drill for oil was in Bóbrka in western Galicia in 1854. By 1867, a well at Kleczany, in Western Galicia, was drilled using steam to about 200 meters. On 31 December 1872, a railway line linking Borysław (now Boryslav) with the nearby city of Drohobycz (now Drohobych) was opened. British engineer John Simeon Bergheim and Canadian William Henry McGarvey came to Galicia in 1882. [b] In 1883, their company, MacGarvey and Bergheim, bored holes of 700 to 1,000 meters and found large oil deposits. In 1885, they renamed their oil developing enterprise the Galician-Karpathian Petroleum Company (German: Galizisch-Karpathische Petroleum Aktien-Gesellschaft), headquartered in Vienna, with McGarvey as the chief administrator and Bergheim as field engineer,[c] and built a huge refinery at Maryampole near Gorlice, south of Tarnow. Considered the biggest, most efficient enterprise in Austro-Hungary, Maryampole was built in six months and employed 1000 men. [d] Subsequently, investors from Britain, Belgium, and Germany established companies to develop the oil and natural gas industries in Galicia. This influx of capital caused the number of petroleum enterprises to shrink from 900 to 484 by 1884, and to 285 companies manned by 3,700 workers by 1890. However, the number of oil refineries increased from thirty-one in 1880 to fifty-four in 1904. By 1904, there were thirty boreholes in Borysław of over 1,000 meters. Production increased by 50% between 1905 and 1906 and then trebled between 1906 and 1909 because of unexpected discoveries of vast oil reserves of which many were gushers. By 1909, production reached its peak at 2,076,000 tons or 4% of worldwide production. Often called the "Polish Baku", the oil fields of Borysław and nearby Tustanowice accounted for over 90% of the national oil output of the Austro-Hungarian Empire. From 500 residents in the 1860s, Borysław had swollen to 12,000 by 1898. At the turn of the century, Galicia was ranked fourth in the world as an oil producer. [e] This significant increase in oil production also caused a slump in oil prices. A very rapid decrease in oil production in Galicia occurred just before the Balkan Wars of 1912–13. Galicia was the Central Powers' only major domestic source of oil during the Great War. ^ Encyclopediaofukraine.com: Volodymyr Kubiyovych, Yaroslav Pasternak, Illya Vytanovych, Arkadiy Zhukovsky. ^ William McGarvey helped develop a rig in the 1860s or 70s which made his Canadian drilling technology and Canadian drillers famous around the world. John Simon Bergheim and William Henry McGarvey had unsuccessfully searched for oil in Germany under the Continental Oil Company of which McGarvey was the director. They left Germany and began their first drilling in Galicia during 1882 under the company name of MacGarvey and Bergheim. ^ Just after the turn of the century, Bergheim was killed in a taxicab accident in London, England, leaving McGarvey to carry on alone. ^ Later, Bergheim and McGarvey bought a number of small oil-producing and refining operations and acquired the Apollo Oil Company of Budapest. ^ In 1909, first in the world for oil production was the United States with 183,171,000 barrels, the Russian Empire was second with 65,970,000 barrels, and the Austro-Hungarian Empire was third with 14,933,000 barrels per year due to its significant oil reserves discoveries between 1905 and 1909. ^ See also: Eleonora Narvselius (5 April 2012). "Narratives about (Be)longing, Ambiguity, and Cultural Colonization". Ukrainian Intelligentsia in Post-Soviet Lʹviv: Narratives, Identity, and Power. Lexington Books. p. 293. ISBN 978-0-7391-6468-6. Retrieved 10 March 2019. [...] the 'Austro-Hungarian "pedigree" of Galicia becomes the passport to genuine, non-Eastern Europe.' [...] Otto von Habsburg [...] expressed clearly that all of Ukraine belongs to Central Europe, which is the ideological construction differing from Russia-dominated Eastern Europe. ^ Larry Wolff (9 January 2012). "Mythology and Nostalgia: A Matter of Simple Relativity". The Idea of Galicia: History and Fantasy in Habsburg Political Culture. Stanford University Press. p. 411. ISBN 978-0-8047-7429-1. Retrieved 1 January 2019. ^ Paul Robert Magocsi (2002). "Jews and Armenians in Central Europe, ca. 1900". Historical Atlas of Central Europe. University of Toronto Press. p. 124. ISBN 978-0-8020-8486-6. Retrieved 1 January 2019. ^ "European Kingdoms - Eastern Europe - Galicia". The History Files. Kessler Associates. Retrieved 13 December 2014. ^ Zakharii, Roman. "History of Galicia". Toronto Ukrainian Genealogy Group. Retrieved 1 January 2019. ^ "Entry for Galicia (Halychyna) in Historical Glossary". Ukrainians in the United Kingdom online encyclopaedia. 2018. Retrieved 1 January 2019. ^ a b "Rex+Galiciae+et+Lodomeriae" Die Oesterreichisch-ungarische Monarchie in Wort und Bild, Volume 19 (in German). Austria: K.K. Hof- und Staatsdruckerei. 1898. p. 165. Retrieved 1 December 2015. Um welchen Preis er dies that, wird nicht überliefert, aber seit dieser Zeit, das ist seit dem Jahre 1206 findet sich in seinen Urkunden der Titel: "Rex Galiciae et Lodomeriae"
^ Martin Dimnik (12 June 2003). The Dynasty of Chernigov, 1146–1246. Cambridge University Press. pp. 266–. ISBN 978-1-139-43684-7. Retrieved 13 December 2014. ^ Wilson, Andrew (2006). Ukraine's Orange Revolution. Andrew Wilson (historian): Yale University Press. p. 34. ISBN 0-300-11290-4. ^ Berend, Urbańczyk & Wiszewski 2013, p. 441. ^ Max Vasmer points to Russian galitsa, an adjectival form meaning "jackdaw" - see Galich in Russisches Etymologisches Wörterbuch (1950-1958). ^ Tadeusz Sulimirski, The Sarmatians, vol. 73 in series "Ancient People and Places", London: Thames & Hudson, 1970. ^ Dimnik, Martin (2003). The Dynasty of Chernigov - 1146-1246. Cambridge: Cambridge University Press. pp. (Chronological table of events) xxviii. ISBN 978-0-521-03981-9. ^ Charles Cawley (19 May 2008). "Russia, Rurikids – Chapter 3: Princes of Galich B. Princes of Galich 1144-1199". Medieval Lands. Foundation of Medieval Genealogy. Retrieved 26 December 2009. ^ French: Les Alliés reconnaissent à la Pologne la possession de la Galicie, Chronologie des civilisations, Jean Delorme, Paris, 1956. ^ Magocsi, Paul R. (2002). The Roots of Ukrainian Nationalism: Galicia as Ukraine's Piedmont. Toronto: University of Toronto Press. p. 57. ^ Keely Stauter-Halsted (28 February 2005). The Nation In The Village: The Genesis Of Peasant National Identity In Austrian Poland, 1848-1914. Cornell University Press. p. 26. ISBN 978-0-8014-8996-9. Retrieved 4 April 2013. ^ a b Norman Davies (31 May 2001). Heart of Europe:The Past in Poland's Present. Oxford University Press. pp. 331–. ISBN 978-0-19-164713-0. Retrieved 8 April 2013. ^ a b c d e f g h i j k Schatzker, Valerie; Erdheim, Claudia; Sharontitle, Alexander. "Petroleum in Galicia". Drohobycz Administrative District: History. Archived from the original on 10 April 2016. Retrieved 20 April 2016. ^ a b c d Golonka, Jan; Picha, Frank J. (2006). The Carpathians and Their Foreland: Geology and Hydrocarbon Resources. American Association of Petroleum Geologists (AAPG). ISBN 9780891813651. ^ a b c d e f Creswell, Sarah; Flint, Tom. "William H. McGarvey (1843 - 1914)". Professional Engineers Ontario. Retrieved 20 April 2016. ^ a b c d e f Frank, Allison (29 June 2006). "Galician California, Galician Hell: The Peril and Promise of Oil Production in Austria-Hungary". Washington, D.C.: Office of Science and Technology Austria (OSTA). Retrieved 20 April 2016. ^ Thompson, Arthur Beeby (1916). Oil-field Development and Petroleum Mining. Van Nostrand. ^ Schwarz, Robert (1930). Petroleum-Vademecum: International Petroleum Tables (VII ed.). Berlin and Vienna: Verlag für Fachliteratur. pp. 4–5. Buttar, Prit (2016). Collision of Empires: The War on the Eastern Front in 1914. Osprey Publishing. ISBN 9781782006480. Frank, Alison Fleig. Oil Empire: Visions of Prosperity in Austrian Galicia (Harvard University Press, 2005). A new monograph on the history of the Galician oil industry in both the Austrian and European contexts. Andrei S. Markovits and Frank E. Sysyn, eds., Nationbuilding and the Politics of Nationalism: Essays on Austrian Galicia (Cambridge, Massachusetts: Harvard University Press, 1982). Contains an important article by Piotr Wandycz on the Poles, and an equally important article by Ivan L. Rudnytsky on the Ukrainians. A.J.P. Taylor, The Habsburg Monarchy 1809–1918, 1941, discusses Habsburg policy toward ethnic minorities. Wolff, Larry. The Idea of Galicia: History and Fantasy in Habsburg Political Culture (Stanford University Press; 2010) 504 pages. Examines the role in history and cultural imagination of a province created by the 1772 partition of Poland that later disappeared, in official terms, in 1918. Przemyśl is a city in south-eastern Poland with 66,756 inhabitants, as of June 2009. In 1999, it became part of the Subcarpathian Voivodeship; it was previously the capital of Przemyśl Voivodeship. Red Ruthenia or Red Rus' (Latin: Ruthenia Rubra; Russia Rubra; Ukrainian: Червона Русь, translit. Chervona Rus'; Polish: Ruś Czerwona, Ruś Halicka; Russian: Червонная Русь, translit. Chervonnaya Rus') is a term used since the Middle Ages for a region now comprising south-eastern Poland and adjoining parts of western Ukraine. It has also sometimes included parts of Lesser Poland, Podolia, "Right-bank Ukraine" and Volhynia. Centred on Przemyśl (Peremyshl), it has included major cities such as: Chełm, Zamość, Rzeszów, Krosno and Sanok, as well as Lviv and Ternopil. The Ruthenian Voivodeship was a voivodeship of the Crown of the Kingdom of Poland from 1434 until the 1772 First Partition of Poland. with a center in the city of Lviv. Together with a number of other voivodeships of southern and eastern part of the Kingdom of Poland, it formed Lesser Poland Province of the Polish Crown, with its capital city in Kraków. Following the Partitions of Poland, most of Ruthenian Voivodeship, except for its northeastern corner, was annexed by the Habsburg Empire, as part of the province of Galicia. Today, the former Ruthenian Voivodeship is divided between Poland and Ukraine. Volhynia, is a historic region in Central and Eastern Europe, situated between south-eastern Poland, south-western Belarus, and western Ukraine. While the borders of the region are not clearly defined, the territory that still carries the name is Volyn Oblast, located in western Ukraine. Volhynia has changed hands numerous times throughout history and been divided among competing powers. At one time all of Volhynia was part of the Pale of Settlement designated by Imperial Russia on its southwestern-most border. Carpathian Ruthenia, Carpatho-Ukraine or Zakarpattia is a historic region in the border between Central and Eastern Europe, mostly located in western Ukraine's Zakarpattia Oblast, with smaller parts in easternmost Slovakia and Poland's Lemkovyna. Before World War I most of this region was part of the Kingdom of Hungary. In the interwar period, it was part of the First and Second Czechoslovak Republic. During World War II, the region was annexed by the Kingdom of Hungary once again. After the war, it became part of Soviet Ukraine. Halych is a historic city on the Dniester River in western Ukraine. The city gave its name to the historic province of Galicia (Halychyna), to the Principality of Halych and to the Kingdom of Galicia–Volhynia, of which it was the capital until the early 14th century, when the seat of the local rulers moved to Lviv. The Kingdom of Galicia and Lodomeria, also known as Galicia or Austrian Poland, was established in 1772 as a crownland of the Habsburg Monarchy as a result of the First Partition of Poland. After the Third Partition of Poland in 1795, it became a Kingdom under Habsburg rule. In 1804 it became a crownland of the Austrian Empire. From 1867 it was an ethnic Pole-administered autonomous crownland under Cisleithanian Austria-Hungary, until its dissolution in 1918. The country was carved from the entire south-western part of the Polish–Lithuanian Commonwealth. Among the many ceremonial titles of the princes of Hungary was "ruler of Galicia and Lodomeria". Following the Napoleonic Wars and the Congress of Vienna, the Austrian Empire ceded portions of Galicia to the Russian Empire, West Galicia and Tarnopol District. Lodomeria is a derivative name (Latinized) of Vladimir which was a name of the Ruthenian duchy, Volhyn a western Kievan Rus' principality founded by the Rurik dynasty in 987 centered in the region of Volhynia, straddling the borders of modern-day Poland, Ukraine and Belarus. The duchy of Vladimir arose in the course of the 12th century along with the duchy of Halitch (Halicz). Daniel of Galicia was a King of Ruthenia, Prince (Knyaz) of Galicia (Halych) (1205–1255), Peremyshl (1211), and Volodymyr (1212–1231). He was crowned by a papal archbishop in Dorohochyn 1253 as the first King of Ruthenia (1253–1264). The Polish–Ukrainian War of November 1918 and 1919 was a conflict between the Second Polish Republic and Ukrainian forces. The conflict had its roots in ethnic, cultural and political differences between the Polish and Ukrainian populations living in the region. The war started in Eastern Galicia after the dissolution of the Austro-Hungarian Empire and spilled over into Chełm Land and Volhynia (Wołyń) regions formerly belonging to the Russian Empire, which were both claimed by the Ukrainian State and the Ukrainian People's Republic. The history of the Ukrainian minority in Poland dates back to the Late Middle Ages, preceding the 14th century Galicia–Volhynia Wars between Casimir III the Great of Poland, and Liubartas of Lithuania. Following the extinction of the Rurikid dynasty in 1323, the Polish Kingdom extended further east in 1340 to include the lands of Przemyśl and in 1366, Kamianets-Podilskyi. After the Union of Lublin (1569), principalities of Galicia and Western Volhynia became, what is known as, the Ruthenian Voivodeship of the Polish Crown, while the rest of Red Ruthenia together with Kiev came under Lithuanian control. The Polish borders reached as far east as Zaporizhia, and Poltava. Denis Ivanovych Zubrytsky (Ukrainian: Дени́с Іва́нович Зубри́цький, was the first Ukrainian historian in Galicia and a major early figure in the Galician Russophile movement.